He succeeded in forming his own music band in the era when the Beatles and Rolling Stones were at their height, and they called themselves The Flies. From the halls of the School of Business Science at the University of Melbourne, he moved on to singing beside Mick Jagger in fulfillment of a dream. Now he is found in Africa as a missionary. How did this Greek, Themi Adamopoulos, come to choose to help the needy? Why did he renounce fame in order to seek a more peaceful yet sacrificial existence? Themi was born in Egypt to Greek parents and raised in Melbourne, Australia. He was a child of the 60's and once went to his mother saying “religion is the opiate of the masses" giving her a taste of his Marxist views. His pious mother was terrified by his confession and upon hearing it made the sign of the cross and turned to prayer before her iconostasis. "Like any 'normal radical', I believed that there was no God. I was very much affected by the Nietzschean 'God is dead' school, yet I could not see my way past the following contradiction: on the one hand, I held to the critique of rationalism, the idea being that there is only a myth of rationality and that at bottom everything is subjective; but on the other hand when it came to God I applied rational critiques. That was my philosophical contradiction. The perspective I had, then, was the traditionally Marxist view that there was no God and that Christianity was basically 'the opium of the masses', a tool of the bourgeoisie to oppress the proletariat by the myth of the kingdom of heaven. I was drawn into this spiritual radicalism. I wanted to know more about this new frontier. Was it true what Nietzsche, Russell and the logical positivists had told us, that there is no God? Was it true what the Marxists told us, that the only reality we could know was political reality? I personally was drawn towards exploring these questions. In a way the New Left had its scouts to seek out the new frontiers of reality and existence, and then to report back and say, 'Hey listen! This is good! We need to incorporate a spiritual dimension into our Utopian society of the future.' So in a way I appointed myself a spiritual scout to go and find out what exactly this was all about. I began, then, to experiment with my concepts of reality, questioning everything and seeing whether or not there were truths in Buddhism, in Hinduism, and in Christianity. I would therefore go to Hare Krishna temples and Hindu shrines, I would explore transcendental meditation, and I would even read St. Augustine's City of God and the Bible." At the time Themi was in the first year of the School of Business Science at the University of Melbourne, though he did not complete his studies for this major. Political Science and Philosophy were more reflective of his interests at the time, as he revealed in his interview for Neos Kosmos. Parallel with his student life, he began adding little by little toward his brilliant career in the area of music. Being influenced by the music of The Beatles and the Rolling Stones, he formed the group The Flies. “I thought that after 'beatles' had so much success, why not 'flies'? The climate was right and we took advantage in the extreme. We had great success. We put on concerts in all of the larger cities in Australia, always in jam-packed concert halls. 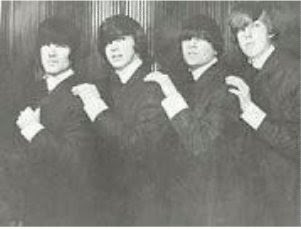 The pinnacle was when we were invited to play with the Rolling Stones in their first tour of Australia in 1965 at the Palace Theatre. Being right there next to Mick Jagger…it was unbelievable, but true!" "During this period I came under the influence of popular music. It was the time of the English pop music explosion and I formed a group in my spare time imitating the Beatles and the Rolling Stones. We became rather successful. In fact, in a sort of curious way I pride myself in having belonged to the first long-haired group in Australia, long hair being then the symbol of the new revolution of the youth. We produced records, we even had Top 10 hits, and we had a fan club - I would get letters every day, with messages written on the envelope such as: 'Postman, postman, don't be slow! Be like Themi: go, man, go!' We would practice in the garage of Ronnie Burns' mum's house; I even met Ian 'Molly' Meldrum." Of course, his fame did not detract from his concern for the social issues of his day. He took part in the mobilization of young people to stop the war in Vietnam, he was concerned about human rights and the protection of those in jeopardy, he supported the women’s rights movement, and he studied intently different religious beliefs trying to find an answer to the existential questions which troubled him. "The discovery of Christ came during this period of experimentation, consciousness-alteration, and self-analysis. Eventually, I underwent what you might call a 'Christian mystical experience'. But I wasn't looking for it, and by inclination I would've preferred a Buddhist kind of explanation of reality, as that would have fitted in much better with the culture and trends of the day. But I found that this Christian experience was overwhelming, and I really had no choice in the end but to be honest to myself and to what I was feeling even though it might not have been so popular among my peers. So, through these 'mystical experiences', I came to believe in Christianity as the authentic road to God and the ultimate truth. Given my background, I immediately turned to my peers on the New Left with the pronouncement that Christ is the truth. This, however, did not go down too well with them! But I was coming from the perspective that this was a genuine discovery, just as we had discovered, say, the writings of Marcuse or Nietzsche or Marx. But at that time Christianity was equated with the Methodist Church of Australia or the Church of England or with churches that had a history of oppression, and Christianity was also associated with such things as holy wars and crusades. So I was really out on a limb, but I didn't let go. For I had found a side of Christianity that seemed to be ignored - viz., the existential, mystical and sensitive side of Christianity." “In 1972 I abandoned everything - academic career, titles, aspirations, dreams - and returned to Orthodoxy. I saw the works of Mother Teresa and despite my university position which provided a good salary, I felt poor, very poor. I began then a new life. Having the baggage of my academic past, I began to study theology. I received my degree from the Catholic theological school Corpus Christi. Then with the guidance of Archbishop Stylianos I studied at Holy Cross School of Theology in Boston. At the same time, I studied Hebrew and Ancient Greek at Harvard University. Then I received my Doctorate in Theology from Princeton University and returned to Australia where, from 1988 until 1998, I taught at Saint Andrew Theological School in Sydney, while also teaching theology and the Coptic language (an ancient Egyptian language) at the University of Sydney. As an academic, I had a future. I was not however content. I was following the work of Mother Teresa and I was made aware of an enormous void within me. I was not with the poor. I did not need to struggle in the least for myself. Inside of me grew a desire to be near the poor and to do whatever possible to make their life more humane. I felt that all my education lead to this path. This was the essence. I then sought the blessing from His Eminence to begin a mission in Africa. In 1999 I began my work in Kenya at the command of His Beatitude the Patriarch of Alexandria and all of Africa, Peter, after I was consecrated a deacon, priest and then archimandrite. 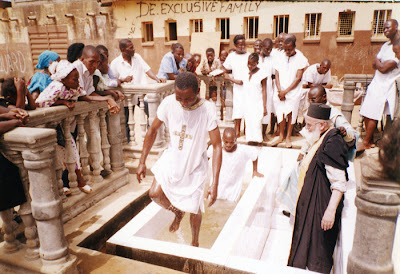 There the first Orthodox college was founded which is called the Orthodox Teacher’s College of Africa. I believe that education is the greatest weapon mankind has in life. If you want to help your fellow man, teach the skill to fish and do not just give him a prepared fish. At the college we are preparing young people to become teachers at the preschool and elementary levels. In the installment of such programs we are also introducing the branch of Sociology." The next step in the enormous undertaking of the mission he has before him is “to build a preschool and elementary school for the very poor children, who are not able to go to school because their feet are bare and their stomachs empty." He is quick to provide for the children as much as possible things such as clothing, shoes and food (in no particular order), and next in importance is the welfare of the women. Fr. Themi says: “Women are the greatest victims in Africa. They are the heart of the family. The man if he is able has two or three wives and produces children with all of them. The woman is the one selling her body for a piece of bread, so that her children might not suffer from hunger. For this reason I opened a Sewing School, where the women learn a trade and earn their bread honorably." 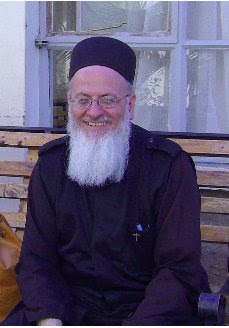 From Kenya, in 2007, the new Patriarch Theodore, who followed closely the work of the mission and the humanitarian Fr. Themi Adamopoulos, gave to him the order to go to West Africa, to Sierra Leone. There a civil war lasting a full twelve years had destroyed the place, and has left the most horrific scenes. Children mutilated, faces and bodies disfigured, people who live on the streets and breathe their last breath there. Death is part of the their daily life. It “lives” there beside them and among them. “There we are building a village for 100 disabled people who begged on the streets, and the police pursued and persecuted them everywhere. We started with the Church of Saint Moses the African in the region of Waterloo, then a trade school of carpentry and sewing, and then homes, a clinic and a school. In Freetown, the capital of Sierra Leone, we founded the first school for 1,200 children which has 60 teachers. Next year we will create an Orthodox college for the poor. There are children who have merit, but they do not have the means to go to even Elementary School. We ought to help." The women in the prisons of Freetown are those who grab his constant attention and he will care for their rehabilitation after their discharge. “If they do not have a respectable job, it is not possible for them to not end up again there. So I make sure they can have a sewing class inside of prison and upon their release I give them a sewing machine." His next step was to give arms and legs to the amputee children: “It is the most horrible sight, the most tragic victims of the war. By next year I hope to open a clinic where artificial hands and feet will be provided for thousands of children and youth to give them a new life and return back to them their dignity. Today they are begging and are harassed by the police." This great work is supported financially by two large philanthropic organizations in Australia, “Paradise Kids for Africa” and “Light of the World Australia”, which has commissions in all of the cities in Australia for the same purpose. Also, in Greece, specifically in Thessalonica there is great support from the Christian Brotherhoods. One of them is “Saint Kosmas Aitolos”. It is too bad Fr. Themi isn't the famous idol he once was to his fans, because the work he does now is far more significant and deserves much more praise and support. "Now after a lifetime of experiences this is who I am. A servant of the Most High God and a Servant and Apostle to the Poor and Oppressed."